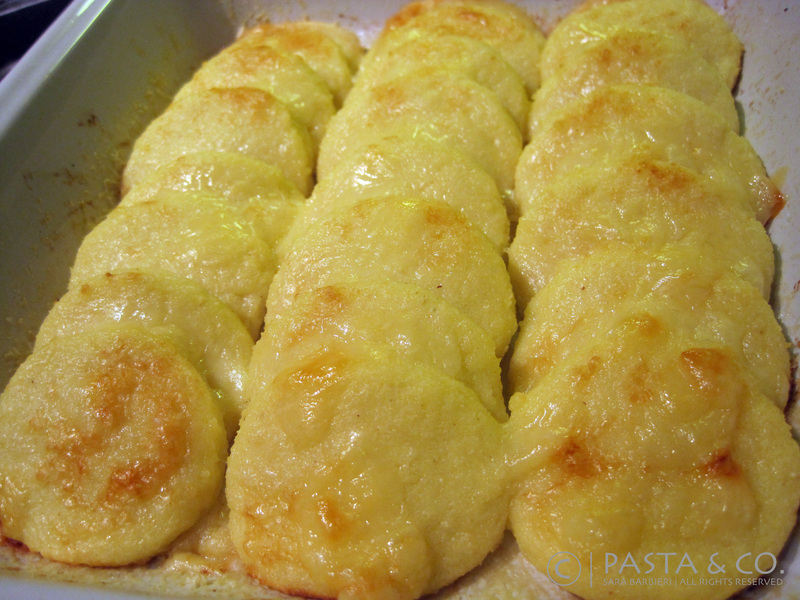 Thursday Gnocchi – alla Romana! | Pasta & Co.
Thursday Gnocchi – alla Romana! If it’s Thursday, it must be gnocchi! In some restaurants throughout Italy, Thursday specials are traditionally still reserved for gnocchi, especially in Rome, following the saying “Thursday gnocchi, Friday fish (or “beans and salt cod”), Saturday tripe“. “Ridi, ridi, che mamma ha fatt’ i gnocchi” (‘Laugh, laugh, mommy made gnocchi) is another saying that stresses the importance of Thursday as an almost festive day, with an elaborate and hearty dish, and the need to prepare for a simple and lean dish the following day. 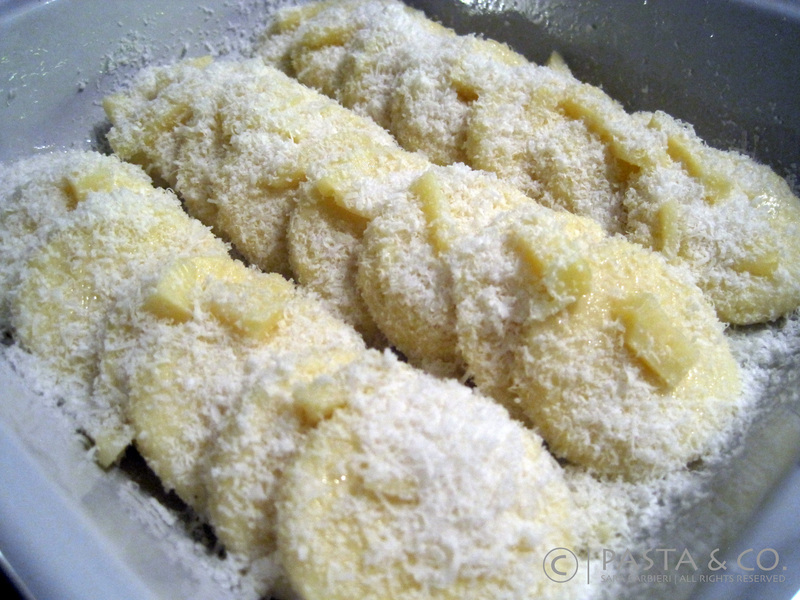 Gnocchi alla Romana are an alternative to the fluffy potato dumplings. These tender gnocchi are prepared in the Roman style using semolina flour plus milk, butter, egg yolks and Parmigiano-Reggiano cheese. 1) Preheat the oven to 395 degrees. 2) In a 2-qt saucepan, heat to scald the milk and a pinch of salt. When the milk starts to boil, pour in the semolina in a thin stream, whisking vigorously. 3) Cook for about 10 minutes switching to a wooden spoon as it thickens. Remove from heat and allow to cool for a couple of minutes. Stir in one yolk at a time, the grated Parmigiano and butter. 4) Pour the semolina onto a buttered cookie sheet (or on a parchment paper sheet) and, using a spatula, spread to a thickness of 1/2-inch. Allow to cool. 5) Using a round cookie cutter, cut 1.5-inch quarter rounds out of semolina. Arrange the rounds so that they overlap in a buttered baking dish and sprinkle with butter (or even fontina or swiss cheese if you like!) and grated cheese. 6) Place in oven and cook 10 to 15 minutes, until golden brown. Remove from the oven, allow to cool and serve. While cutting semolina rounds, keep nearby a saucer with some olive oil. It will come handy to grease the cookie cutter and avoid sticking. Don’t waste the semolina leftovers – rather knead the dough again and cut new rounds.